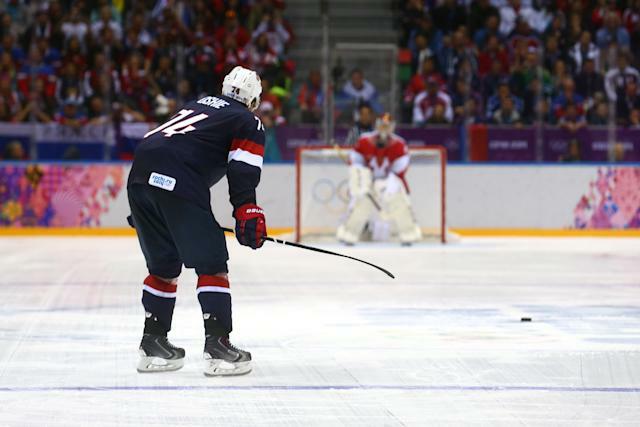 Were it not for the shootout, T.J. Oshie wouldn’t have gotten a shoutout from President Obama. He wouldn’t have appeared on “The Today Show.” He wouldn’t have been mentioned in the same breath as Mike Eruzione, the embodiment of miraculous Olympic performances for American-born hockey players. Then again, were it not for the shootout, T.J. Oshie probably wouldn’t have been in Sochi last February to make hockey history. The Team USA braintrust, via Scott Burnside’s indispensible report on the construction of the 2014 men’s ice hockey team, had the final forward spot down to Bobby Ryan, Brandon Saad and Oshie. Chicago Blackhawks GM Stan Bowman pushed for his guy, Saad, as a better all-around player than Oshie. GM David Poile of the Nashville Predators, however, argued that Oshie would be good for the locker room – and for overtime. "Oshie's got that shootout move," said Poile. Boy, did he. Heading into the 2013-14 season, Oshie was around 50 percent in his career in the shootout thanks to a patented move that saw him deke to the five-hole, go forehand to backhand to forehand in a millisecond and the tuck the puck behind a baffled goalie. It’s the move he used on his first attempt in the NHL. It’ll probably be the move he uses in his last attempt in the NHL. It’s the move that may have earned him a place in the Sochi Games. That’s because the braintrust knew, inevitably, that the U.S. would play a close game necessitating a shootout. Which they did. Against the host Russians. One year ago today, on Feb. 15, 2014. The Russians and Americans were aware they’d clash in the second game of the Group A preliminary round since the seedings were announced. Despite those stakes, the Russian media treated the game as some sort of Miracle on Ice score-settling affair at the Bolshoy Ice Dome. Beating the Americans would be the first great moment in a run to gold on home ice. The Americans entered the game after a 7-1 dismantling of Slovakia, and the Russians after a 5-2 win over Slovenia that was uncomfortably close. With the benefit of hindsight, we know both of these results aren’t all that mind-blowing. But the Russians were coming off a “disappointment” that needed to be erased with a win over the U.S. I remember pockets of blue Team USA jerseys in the crowd, but it was solidly pro-Russian, with flags waving like it was a national holiday. And the roof came off the place at 9:15 of the first period, when Pavel Datsyuk converted a home-run pass from Andrei Markov and beat Jonathan Quick. The Russians carried play, but couldn’t build on the lead, couldn’t land that right hook that would have staggered the U.S. With 3:26 left in the second, Cam Fowler converted on the power play against Sergei Bobrovsky to tie the game, and then Joe Pavelski scored another power-play goal at 9:27 of the third for the 2-1 lead. Datsyuk scored again just over three minutes later with Dustin Brown in the box to knot the game again. Had it not been for the shootout that would decide this classic, Fedor Tyutin’s waved-off goal with 4:40 left in the game might be its indelible memory. Remember Quick knocking off the left post sliding to make the save, the red peg bent but the net still connected? Remember the stunned disbelief from the Russians who didn’t know the IIHF rule? Remember those Russian fans that wanted to turn referee Brad Meier into soap? The game went to overtime, and the U.S. had three chances to win it there: a power play they didn’t convert, a breakaway that Patrick Kane couldn’t convert, and another Kane chance late that was also stopped by Bobrovsky. The shootout could have very well been Bobrovsky’s Olympic legendary moment. He got the start after Semyon Varlamov was criticized for his performance vs. Slovenia. A reporter went as far as to tell coach Zinetula Bilyaletdinov that it would be a “death sentence” to bring back Varlamov against the U.S.
Oshie took the first attempt, beating Bobrovsky five-hole. The next four shooters couldn’t score. The U.S. was one save away from victory, but that save required Quick to best Ilya Kovalchuk and, well, it was Ilya Kovalchuk. He scored. It was time for extra rounds. Thus began the T.J. Oshie Show for the U.S.
International rules allowed teams to designate one shooter for the rounds following the initial three, because the IIHF evidently understands the inherent drama and star-making mechanics of the gimmick better than the NHL does. Until this point, the most famous star-making shootout performance in extra rounds was Jonathan Toews in 2007 at the world juniors. Little did we know we were on the cusp of another one. Kovalchuk was back for another attempt for Russia, only to see his shot saved. Oshie was up next, the game on his stick for the first time. He missed high over the cage. Datsyuk beat Quick in Round 5. There was some mystery, for a moment, if Dan Bylsma would use Oshie again. He did. He scored, five-hole. The drama continued. Kovalchuk again. He scores. Oshie again. Off the crossbar, off Bobrovsky, into the net. Just like he diagrammed it, for sure. Datsyuk again. Quick makes the save. Oshie again. Misses the net. Round 8 of the shootout. I remember the atmosphere at this point had become a cocktail of witnessing history, patriotic pride, hoping for heroism, praying there wasn’t a glaring mistake, wanting the thing to end just to open the pressure valve but quietly wishing it wouldn’t. Kovalchuk missed on Quick. Oshie, again. Just writing that brings me back to Herb Brooks in practice, trying to coax every bit of desire and effort from his players in 1980: “[Blows whistle] AGAIN! [Blows whistle] AGAIN!” An American hockey fan always ties it back to the Miracle, and here we were again: as "underdog" a player as there was on the roster, battling the mighty Russians. The whistle blew, and it was Oshie, again. Each attempt started the same way: Slow, methodical skating, exuding a gunslinger’s confidence, not showing Bobrovsky anything. He loped over the blue line and began skating to his left. He went to the backhand and glided back to the right. Bobrovsky anticipated the deke. Why wouldn’t he? It was Oshie’s signature. Instead, Oshie snapped it through Bob’s pads. It wasn’t “the move.” It was improv, in the moment. Well, for a few weeks. He had done this against Slovakia or Slovenia, it makes an impact. He gets him on SportsCenter. But Oshie did this against Russia. In Sochi. The world was watching. Especially America. I followed the aftermath from afar. In the Sochi Olympic bubble, we understood OshieMania, but tracked the path of its waves through social media. There was the fake Tinder profile someone made of him. There was the Wiki edit that identified him as an American hero before even being called a hockey player. Back in Sochi I remember there was a sense that any and all coverage of Oshie was what fans back home wanted. Whether it was profiles of him, interviews with former coaches, stories on his fiancé, capturing the birth of this Olympic legend. "The American heroes are wearing camo. That's not me." But there was also the reality of what Oshie accomplished: a victory in the preliminary round, albeit an extraordinary one. It wasn’t in the medal round. It wasn’t against Canada. All of this would become very apparent in the coming weeks. I reached out to Oshie this week but we couldn’t connect, which is a shame, because I had but one question to ask: How do you balance that life-changing moment in Round 8 of the shootout against Russia with the total disaster that was the end result for the U.S. in Sochi? Do you look at those mementos from last year without aching for the medal the Americans squandered by losing to Canada and then failing to give a damn in the bronze medal loss to Finland? Can individual achievement be celebrated among the embers of a flamed out medal effort? I imagine it’s difficult. I’ve spoken to a good number of Americans from the 2010 Vancouver Olympic team that couldn’t stomach their silver medals for quite a while after the Crosby goal. One year later, Oshie’s moment feels like an acting performance for the ages in a mediocre film. The other thing I’ve come to realize about the Oshie shootout is that because Olympic rights are what they are today, you can’t, like, watch it anywhere. It’s not readily available on YouTube due to copyrights. The NBC link to the full shootout is long dead. Some Vines, some GIFs, some still images over news reports. But as an essential, unforgettable highlight in hockey history, it’s found mostly in our memories. My memory, faulty as it can be at times, recalls a Russian crowd unable to process what they just saw – hell, the Bolshoy Dome roof never did get around to posting that final score. It recalls American players and fans being overcome by the pressure release of the shootout, of playing the ultimate spoiler against the "evil empire" hosting the event. But mostly I remember how the Oshie shootout did what so few things can do today, which is bring the nation together in the same conversation. The Super Bowl. Awards Shows. The Olympics. We still have these touchstones where everyone tunes to the same channel among their 500 digital networks, clicks on the same hashtag, has the same conversation around the theoretical water cooler at the office. This never happens for hockey in the U.S. Not even in 2010. Maybe not since 1980. But it did that morning on Feb. 15, 2014. T.J. Oshie was all anyone could talk about, and by default so was hockey. I don’t know if the NHL will ever go back to the Olympics. Frankly, I’m starting to doubt it. But Oshie’s moment is the opportunity the games provide that no World Cup of Revenue Generation does: The chance for a 27-year-old from Everett, Washington, who honed his skills with North Dakota and represented his country in international tournaments and could never previously be considered a star to become one. And get a stick-tap from the Commander-in-Chief.